SVRA US Vintage GP p/b Jaguar, Watkins Glen NY. Ask someone to sketch a “Le Mans car” on the back of a napkin and the outline of the Porsche 962 will likely emerge. The evolutionary arc of Porsche’s closed-cockpit sports prototype can be traced back to the late sixties and seventies. Starting from the 906/910/907 series which were more fluid, creases began to form on the 908 series on through the Group 5 917. By the eighties the chiseled, slab sides are present on the Group 6 936 and its successor the Group C 956. Even as the basic shape remained the same, the cars were destined to compete across multiple categories and continents. Enter the 962 which was designed for the IMSA Grand Touring Prototype class, and later as the 962C it would also compete in FIA Group C.
An exceedingly successful design, it was campaigned by both Porsche factory works teams and numerous privateers. The later would then take a larger role in 962 development and act as manufacturers themselves, building entire cars from all-new chassis tubs and incorporating their own refinements. Top: Arresting in its iconic Rein Orange Jägermeister livery, the No. 17 stands out in the paddock. Also owing to the chassis’ popularity, the 962 has worn many a racing livery in its day. 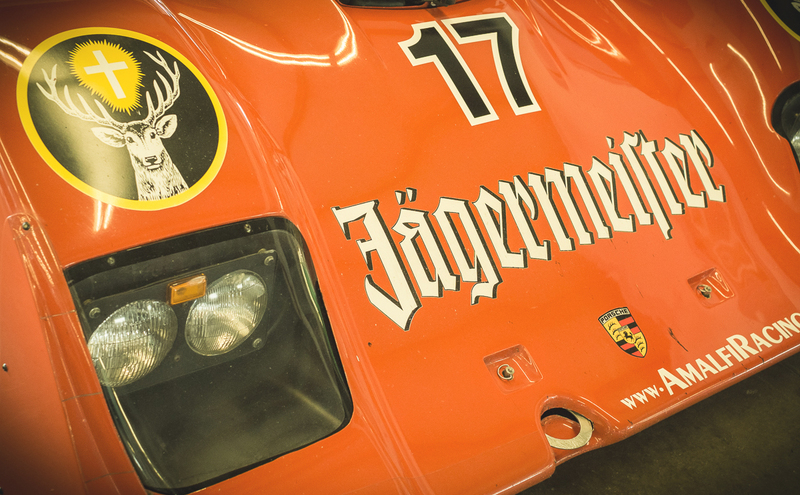 Jägermeister has a long history of sponsoring European motorsports teams and its bold Rein Orange livery is one of the most recognizable and iconic schemes with strong ties to German marques BMW and Porsche. A wholly appropriate choice for cladding this 962. This particular car, Bill Hawe’s No. 17, ties in all these desirable attributes and is a regular participant in the US vintage racing circuit. It is properly raced and quite a majestic sight as it swept though essess and throttled the straights on the historic Watkins Glen track. As presented here, it is captured in a brief moment of calm whilst garaged in the paddock – being prepared and quietly waiting for the next opportunity to take to the track. The wide, squared flanks of the 962. The block sides emerged on the 936. An intimidating console surrounds the driver with numerous gauges and switchgear. The steering wheel is refreshingly unadorned compared to modern racing machines. Doors open, the stiffness required of the chassis tub becomes apparent. Some private-manufacture 962s completely abandoned the original aluminum tub in favor of carbon fiber. Rear cowling removed, a single BorgWarner turbocharger and massive intercooler is the most visible motive componentry up on top. Bill Hawe’s helmet sits at the ready in between sessions. Also apparent in this image are the many tech inspection stickers from past events. Buttoned up and ready to run. This particular 962 sports a short-tail rear body with a separate rear wing. Under-body tunnels are seldom visible yet are a critical part of the overall aerodynamic design package. Previous Season’s greetings to all!